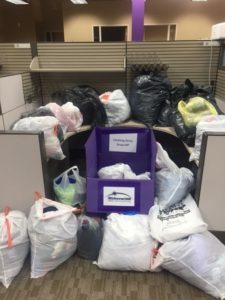 MidwestHR put on a month-long clothing drive to encourage our employees to clean out their closets and give their new or gently used clothing others in our area in need. We collected over 20 bags full of some great clothing for men, women, and children. Like last year, all donations were given to Sharing Connections in Downers Grove, Illinois. Sharing Connections is a non-profit organization that donates gently used furniture, household items, clothes, and more to those in need. Other organizations like food pantries, shelters, and housing organizations refer families to Sharing Connections to help furnish and supply their homes. They help in crisis areas like Domestic Violence, Fires and Floods, Homeless Transitions, Veteran Services, and General Poverty. Sharing Connections donates items to just over 7,000 individuals per year and the families who receive donations bring home about $2,500 worth of items. This organization is truly impacting families in the community through their generous giving efforts and donations! With the generous donations from our family here at MidwestHR, we are doing what we can to give back to the community that continues to support us. Check back next month to see what new outreach project we have in mind!